Hopeful news this week for millions of patients with age-related macular degeneration (AMD), as scientists released results of an easy-to-administer gene therapy that has already helped blind mice see. Scientists at the University of California, Berkeley, genetically engineered a virus to affect particular retinal cells that are not normally sensitive to light. They then loaded up the virus with light sensitive protein genes that turn these cells into light-sensitive, “seeing” cells. The team stumbled over this relatively easy process after traveling down far more complicated avenues of research — which had delivered results, but through more involved procedures. Altered viruses behave more predictably than the original “wild” type virus does, which means doctors will be able to administer the solution into the vitreous jelly of the eye, as opposed to having to aim very carefully under the retina for the genes to take effect. Current therapy for the disease ranges from eating vitamin-rich foods — which can reverse early onset macular degeneration — to painful laser treatments with dangerous side effects for patients with more advanced cases. The disease affects 10 percent of the population over age 55. The UC Berkeley team is confident that the therapy can be upscaled to treat the more complicated human eye, which contains many more ganglion cells than a mouse’s. Ganglion cells, located near the inner surface of the retina, receive visual information. At this stage, the treatment does not restore full vision, just the ability to perceive light and large shapes, scientists said. 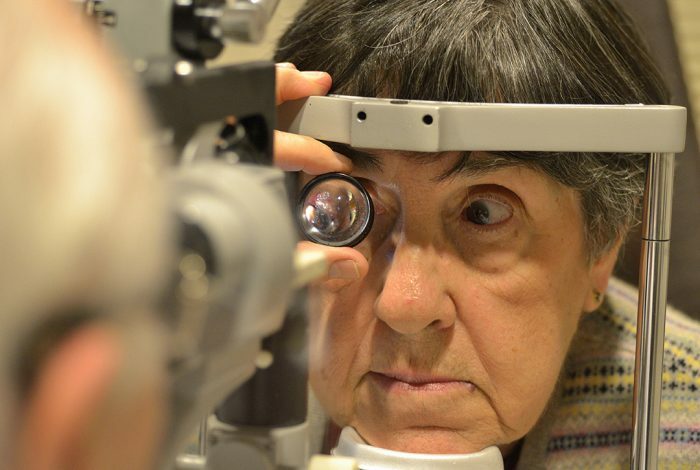 This therapy will need clinical trials and must be approved by the FDA, however, so it is likely that any “cure” for macular degeneration may still be years away. But perhaps, when and if it is approved, doctors will be able to deliver these eyesight-restoring viruses using the mini robots WhoWhatWhy highlighted in a video piece in November 2018. This week’s videos explain what AMD is — with a rather disturbing morph from dear old lady to pair of eyeballs — and how gene therapy works. Related front page panorama photo credit: Adapted by WhoWhatWhy from NIH and zhouxuan12345678 / Flickr (CC BY-SA 2.0) .